One of my favorite art spaces in Sydney is Carriageworks. It is situated in the old railway workshop complex in Eveleigh, not too far from Redfern station. This imposing example of industrial architecture from the late 1800s, with its immense rooms, chipped off walls and impressive iron pillars, is a very appropriate setting for big art installations, the same as Cockatoo Island in Sydney’s harbor. Carriageworks is a good example of how the reuse of old industrial premises for artistic and cultural activities implies the regeneration of the public space and improves its accessibility. The collaboration with the main cultural events that take place in Sydney achieves the integrative goal, engaging audiences to this part of the city. Its program is mainly focused in performing arts, contemporary dance and independent theatre and puts up several resident companies. Nevertheless, the versatility of its spaces makes possible the display of large-scale art installations as we could see in the last Biennale of Sydney when, for the first time, it was one of the official venues for a few sculpture and video installations. The darkness required for the projections created a somehow phantasmagorical and, at the same time, appealing atmosphere that allowed you to enjoy every one of the videos without any interferences. No doubt it was a great setting and we hope it will keep on being one of the Biennale’s venues in the future. 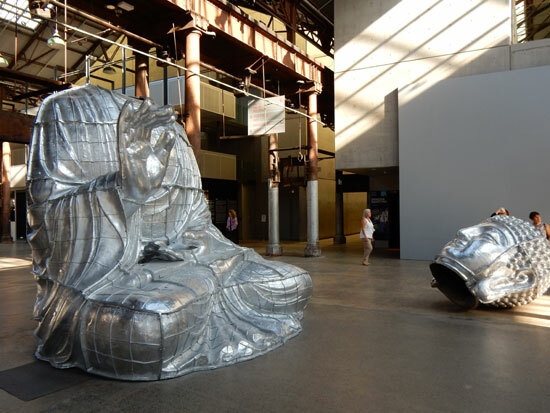 In recent years, every summer Carriageworks showcases a major art installation in collaboration with the Sydney Festival. In 2013 we could see the emotional Waste Not by Chinese artist Song Dong, about her mother’s process of mourning after his father’s death through the collection of every single object in her house. In 2014, Christian Boltanski’s Chance made a big impression because of its magnitude and complexity. 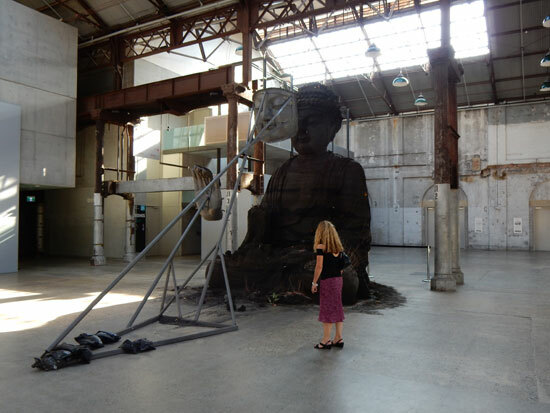 This year, Zhang Huan occupies the old industrial unit with Sydney Buddha two large-scale buddhas (over 5 meters tall). One of them is made of aluminum and is actually the cast of the other one, made of 20 tons of compressed ash from burnt incense sticks that the artist has collected from Buddhist temples in Shanghai’s region. This ash, also present in his paintings, represents the history, the memory and the desires of the Chinese people. It is the soul of every person, the artists says, who has trusted his or her desires and prayers in these incense sticks. The symbolic potential and the creative possibilities of this material which is in China’s daily life and for this very reason it passes unnoticed arrived to Zhang Huan in a crucial moment of his career. After living 8 years in New York he decided to return to China with a renewed view thanks to his vital experience in the Western culture. If in the first part of his career he was mainly focused on a type of performance with an autobiographical and social nature, after his move to Shanghai he got into a more spiritual perspective, where Buddhism and local traditions are pre-eminent. As that proverb that says that traveling makes you wiser, Zhang Huan values the learning of his American stay, which has resulted in a deeper knowledge of his own culture and history. There is another exhibition within the Sydney Festival visual arts program not to miss these days. 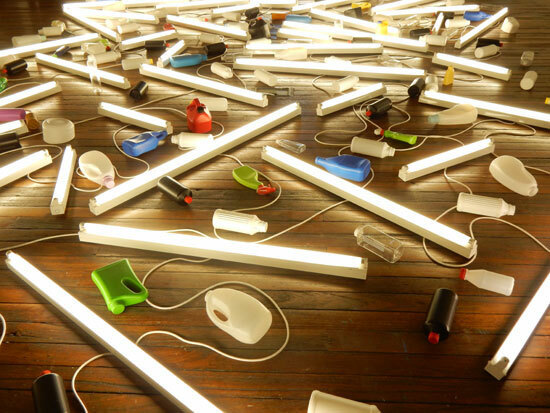 The National Art School in Darlinghurst – another great example of reclaimed space – showcases a retrospective of the emblematic New Zealander sculptor and photographer Bill Culbert. His striking intervention at Santa Maria della Pietà, the New Zealand pavilion at the last Venice Biennale, has granted the reaffirmation of the well-deserved international recognition. Culbert is contemporary to the Minimalist generation and shares important similarities with Dan Flavin’s work. Nonetheless he breaks the distinctive calculated distancing of the Minimalist sculpture incorporating simple domestic objects such as furniture, plastic containers and jars that interact with the light. This exhibition, the largest in Australia up to date gathers his most impressive sculptural and photographic works in the last 35 years. I love the idea of recycling industrial spaces for big art installations and its consequence of facilitating the aproach of artistic and cultural activities to the public. It should be more widely extended.